Ristorante Amore is a Cyanide Tea production originally released April 1, 2012. 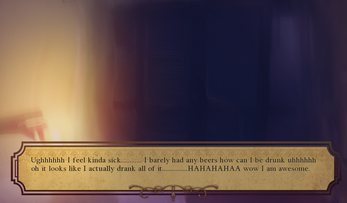 It was created in a month for NaNoRenO 2012. All writing and programming was done by Lore. All art was done by Auro-Cyanide. The interface was a group effort, though Lazcht designed almost all of the assets. Gameplay involves typical visual novel fare such as making decisions at different points in the plot in order to get (at least) one of three different prologue endings and nine different post-prologue endings. We hesitate to assign a label/genre to the game, but the closest things would probably be sci-fi (no, really) and slice of life. Lily Kingston has just graduated from college and is trying to find a new job! Lost and alone, she's helped out by her uncle, who is the owner of a fancy Italian restaurant. She begins working there as a waitress even though she has no experience. Clumsy and yet endearing, she tries hard at her new job and is often helped by her attractive male co-workers... Could one of them win her heart or will their secrets threaten a budding relationship...? PRESS [P] TO BRING UP THE PREFERENCES/OPTIONS MENU IN-GAME. Other keybindings (unique to RisAmo) are listed in the help.txt file and/or are explained in the main menu help scenes. The post-prologue has 9 different endings. Of those, 5 of them have CGs. However, you need to get all 9 endings to full-comp the game and unlock everything. The help button in the main menu does something different than the help button everywhere else. It would behoove you to see what the "main menu help" is like before and after beating the prologue, as the scenes you get are different. Once you've beaten the prologue, it's no longer possible to watch the prologue version of the "main menu help" unless you delete your save files/persistent data. A German version of the game is available here. Okay I gotta be honest, I really liked this game at first, but I quickly had a change of heart. This is going to contain spoilers, so be wary of that. Throughout the Prologue I really enjoyed it! Of course, it is very cliche, but that is what I was looking for. Meeting all of the characters, I couldn't wait to play all of them. Though, then the Post-Prologue came. It is very interesting and a nice twist, but personally I did not like it. It was the opposite of what I was looking for when I downloaded the game. When the Post-Prologue started, I didn't have much of a problem (though, the change to Pierre was really confusing for a bit). I actually liked that the idea of all of the characters being actors. It was really interesting and I've never seen an idea like this before. Though, I never enjoyed playing as Pierre. I found myself constantly waiting for "Lily" to show up so I could play her. I thought that maybe it would turn out that she was real and could have an actual relationship with one of the characters. I was thinking that maybe Pierre's part was just to give an explanation for what was happening. By the time I was at the rehearsal point near the end, I didn't even like the characters anymore. It had nothing to do with their personalities, it was just that everything seemed pointless. Their lives seemed bland, and it was obvious that "I" would not be in the game anymore. I didn't want to play through any of their routes, because I knew it would just lead to this again. I couldn't even stand the rehearsal "Lily's" lines, it all had completely lost my interest. I ended up with the Liam Romance Ending, which was cute and all, but I would have appreciated it more if it had been what I was looking for. I do like that the game isn't what it seems, but this was so far off I just could not enjoy it. 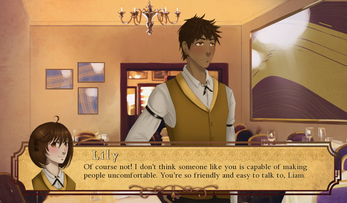 It went from being a cute dating game, to just bland aspects of Pierre's life. I feel like some games can do the whole "not everything is as it seems" style twist very well, like Doki Doki Literature Club, but I personally did not think they did well with this. The original character didn't even come back into play, and their original love interest and ending didn't even seem to matter. The entire premise of the game flipped around and became something entirely different. This was a good game, I just feel like it was not for me. The Post-Prologue became bland as I played it while I just skipped through everything in order to reach the end. If you like playing through characters lives, then you will enjoy this. If you want to play this to get the romantic, fluffy otome like experience, then I doubt you will like this. A very nice game, just not for everyone. like, I think this game is nice, the way it is. Okay..... the Prologue certainly was the ordinary (if not cliche) otome , and I would be very disappointed if only those are all this vn could offer. But d@mn, I was so wrong when I encountered the Post-Prologue. Overall, it is an entertaining story with a good pacing and warm nudge to real life's problem, much to the context of "working and pretending for life or living up the dream". But, I suggest to change the misleading synopsis in this page, at least adds more visible hints to the "real" narration (because some of the readers seems not taking the surprise pretty well :'D ). Or, you can excluding RisAmo from the label of sci-fi genre, for however this vn takes environment in futuristic Alternate Universe and mentions the manipulation of technology in their Earth survival; it still lacks the logical and in-depth explanation or background to the characters' everyday life interaction to the said technology like other focused sci-fi genre fiction (more explained in the comment below mine). Alright, so, I played this a while ago. And I have to say: while the actual romance storylines are good (didn't particularly like Pierre as the protagonist for the second part), the actual plot- well, it- it just doesn't make sense. So the plot line is: these guys are from an alternate universe that for some reason- runs on love. So they have to make real life dating sims or whatever in order to get that love. So then we see their private life as they interact. Okay, so first thing about that: if it was too complicated for you in that exposition dump, and you just didn't get what they were talking about- it's okay! Because it NEVER comes up again. Ever. There was a certain part in the actual game where I ACTUALLY forgot about that weird plot, and it would've stayed that way if Pierre-Kyle or whatever-his-freaking-name-is hadn't of said something about another universe running on the phobia of spiders. And that just brings me into my second point! Why arachnophobia? I mean, how? Why SPECIFICALLY the fear of spiders. Wouldn't the power come from fear itself? Why spiders? Because only the people who have a fear of spiders are gonna be scared of that. Everyone else is just gonna smash the spiders. And if they're making it into a game ('cause that still makes sense) how would that even work? Haven't you ever met someone afraid of spiders? They're kinda pansies. I doubt they're going to play a game specializing in their worst fear. And if someone who's not scared of spiders plays the game, they're not really gonna be scared! And Pierre-Kyle said they run on arachnophobia, so someone without the fear wouldn't be useful, right? HOW DOES THAT EVEN WORK? HOW DOES THIS "POWERING WITH EMOTIONS" THING WORK? Because that isn't explained either! Leading into point three: Seriously. HOW does it work? It isn't explained at all! How is Love going to save the alternate universe anyway? The sun is going out, right? Well, it's only going out in one of two ways: 1.) A giant fiery supernova that's going to destroy everything in the alternate universe's solar system, and guess what? No amount of love is gonna save you from that! 2.) It's going to eventually burn out by first swelling into a giant, where it will then engulf the entire solar system. And again, no amount of love is gonna save you. Okay, let's say theoretically, the sun does burn out and it doesn't destroy their planet. Fine. It would then send the entire planet into an ice age, with ice covering the planet. How is love gonna fix that? Everything will be covered in ice and snow, forget about going outside without freezing to death. Not to mention EVERYTHING will be COMPLETELY dark. No light pretty much whatsoever. How is love gonna fix that? If you say, "oh they're going to make lights or something." then I counter it with HOW? How exactly did they manage to use love as a power source? I'd understand it better if it was that they converted love into power, but that's never explained. In fact, nothing is explained. With that, we go to point four: Nothing is explained. At all. Whatsoever. It gives you the basics, and then runs off. But that's okay, because it never comes back again. They set up all this stuff, and it never comes back. They had a lot of potential with that! Explain it a bit more, explore the whole alternate universe thing, and you could do a lot with that! Maybe they have a different way of speaking, or a different culture, or something like that! But no, they act like normal everyday humans. They were from an ALTERNATE universe, right? Point five: Why was the whole "we need love to power our planet" thing needed again? I mean, it looks like they're actors, they act like they're actors, why weren't they just actors doing a movie? Oh and another thing: Why did they need to be there? Like they're alive inside the game? Why did they need to do that? Why couldn't they have actually made a movie or something? 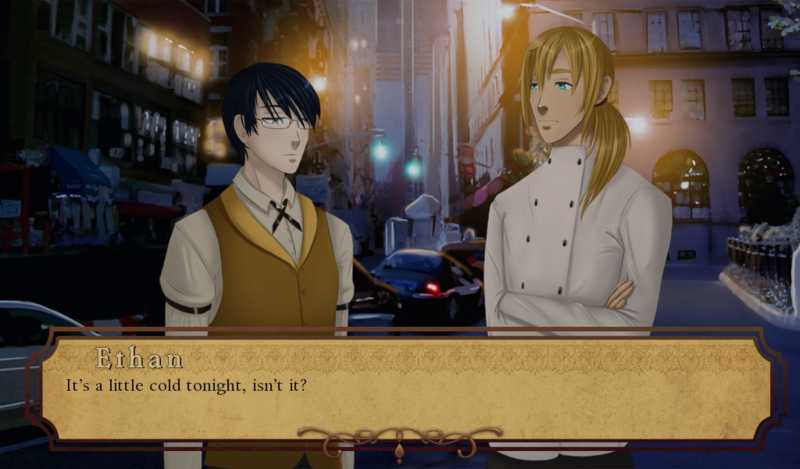 Or better yet, they have anime visuals: why not just just take pictures of them and make an actual dating sim? Or even better yet, they could do motion capture or whatever and then have that animated into an actual game. BAM! The coolest dating sim out there (fully animated) and it frees up so much time. So then why do they choose to make it the most stupid and inefficient way possible to get love? Point Six: I mentioned it before and then got distracted. Why was the whole "we need love to power our planet" thing needed again? I mean, you could've swapped it out with a "they're actors" storyline and it would be barely any different than the original plot. I mean, it's not like you went into detail with the whole alternate universe thing. I suppose maybe you wanted to do a "What do the dating sim characters do when they're not in a dating sim", but you didn't do anything special with it. They're apparently normal people and then it turns into a regular dating sim. The only reason I could think of that made you do this plot is that you had two different stories that you wanted to do with the same characters, so you cobbled together this weak link in the story so you could do 2 in 1. There wasn't any indication of the real story in the page. So why was it kept a secret? It's nothing that special. I honestly feel click-baited. Why did you do that? Did you think no one would want to play a dating sim with gay options (now when I first played the real story I thought the only two choices were Liam or Ethan, but I assume the other two girls are options too)? Seriously, people love this stuff. Did you think no one would want to play the real story? Point Seven: Okay, this one isn't so much about the story not making sense, but whatever. Okay, so Pierre was kind of insulting when the twist in initially revealed. Something about the people playing Lily* was stupid or annoying or something. How we just bothered the characters and that the love was never mutual and stuff. And I mean, we all KNOW the characters don't really love us. They're fake, just programmed to love us for the most part. We're playing these games to FEEL loved (in my case), so then flipping the script and having the characters that we liked say that we're just annoying and intrusive and stuff kinda hurt. Like no one plays these games thinks that the characters genuinely love us. Also Pierre looked like a total douche. Seriously, wife beater shirt and stuff? Now, I definitely ripped this thing apart. But the game was actually fine. 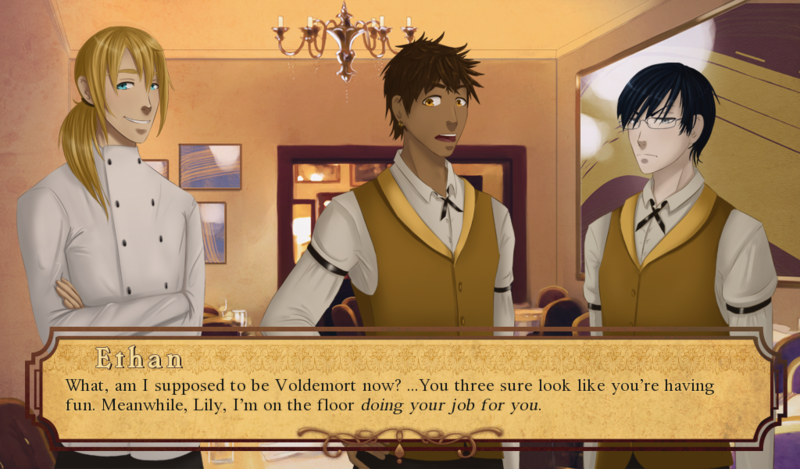 It's not the worst dating sim I've ever played. The actual romancing people section was fine. It was good. It was just the actual plot stuff that didn't make sense. It could've benefited from actual explaining of a lot of things, but y'know. That was pretty interesting. After playing the game, I understand now what some of the comments were referring to. I think it would be interesting to learn more about his life outside of the game, perhaps even see him take another job. If there is one complaint I have, it's the three minute video you have to entice us to play. The script rolled by just a bit too fast to comfortably read, meaning that I had to pause the video multiple times just to know what was going on. And I was disappointed to see that it was basically a word-for-word match of the beginning part of the prologue. Considering the "post-prologue" of the game, I think I can understand why you did it, but it was still a little boring compared to what could have been done with it. I don't usually comment all that much, but I felt like this game needed more positive reviews! 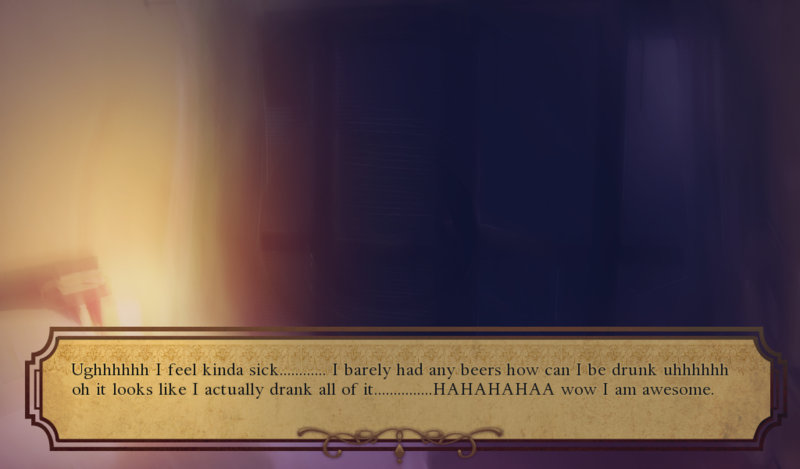 I went into the game without much expectations as it sounded a bit fluffy, but it's definitely got one of the more interesting setups for a VN. A short-mid length story, things really get going after the prologue. All the characters were original, with completely relatable problems, and I really enjoyed all their different relationships with each other. By the end, I honestly felt like I could know any one of them as a friend; though I still like Liam the best! Thanks for a bunch of laughs and a great read--it's deeper than it first appears! I enjoyed the prologue of this story. This was certainly different and interesting. I'm not sure what I felt like being a guy who could fall in love with both guys and girls in the game, despite being a straight girl. But it was a nice game.